Students draw a snowflake and write a story about the snowflake's journey from its birth in the sky to its life on Earth. A snowflake forms when a liquid water molecule becomes a frozen crystallized structure. Students will use Wixie to paint and personify their own unique snowflake and tell the story of that snowflakes adventure as it falls to Earth. This lesson assumes you have talked a bit about seasons and weather with your students and that they are familiar with the temperature and daylight changes in winter. Ask your students about their personal experiences with snow. What activities have then done in the snow? Built a snowman or had a snowball fight? Have they ever captured a snowflake on their tongue or just looked at it when it landed on their jacket or glove? List the things students have done in the snow on an anchor chart or whiteboard. Read Snowflake Bentley to your students. This Caldecott-winning story tells the story of Wilson Bentley, who was fascinated by snowflakes as a boy and was the first person who captured a photograph of a snowflake. He was also the one to claim that "no one design was ever repeated" (no two snowflakes are alike) after taking hundreds of pictures of snowflakes over the course of his life. Ask students to describe how these snowflakes are similar. Be sure they notice that all snowflakes have a hexagonal, or 6-sided, structure. Use this SciShow Kids video if you want to reinforce student understanding of how snowflakes are formed. Have students use a paint or drawing program to design their own unique snowflake. Students can use the Paintbrush tool in Wixie to quickly paint a 6-sided symmetrical snowflake. While it is hard for students at this age to conceptualize that all snowflakes are different, having students draw several flakes with Wixies symmetry tool and seeing how they are all unique, makes it a bit easier. Now that students know a bit about how snowflakes are formed, students will practice personification writing as they create a diary of a snowflakes journey to and on Earth. To help them come up with ideas for their story, have students use the skills they learned designing their first 6-sided snowflakes to create a main character for their story. In addition to drawing a 6-sided snowflake, students should use the paint tools to add facial features that give the snowflake a bit of personality. This might also be a great time to give their snowflake a name. To make the snowflake easier to use on multiple pages, students should convert their painted artwork into a sticker. If they used stickers to add facial features, just make sure they glue these features to the paint layer. Once it is a sticker, it can be copied and pasted on other pages, resized and even flipped or rotated as needed. What character traits does the snowflake have? Does the snowflake have any friends that go on the adventure? What winter activities does the snowflake participate in? Assign a graphic organizer template to help student organize their ideas for their Snowflakes adventure. For example, you might use a cycle organizer to have them identify how the snowflake was formed, two activities it participated in, and how it melted. You might use a beginning-middle-end organizer in the same way. Students should use this organizer to write a first draft of their story. Have them submit the story to you for additional editing ideas. Once they have finished editing, review to see if their work is ready for them to begin using Wixie to develop an illustrated (and narrated) book they will print or share online. Students can simply open their snowflake image in Wixie and add additional pages for each diary entry. They can use the Text tool to add a box where they can type each section of the story. They can use the tools on the Paint panel to design backgrounds and add additional artwork. They may also be able to find relevant Stickers and Backgrounds in the folders in the Library. If students are going to create printed books, they can simply print each page as a full-size image and bind with construction paper covers. If they books are simple four-page projects with a cover, beginning, middle, and end; students can print the projects as four-page foldable booklets. 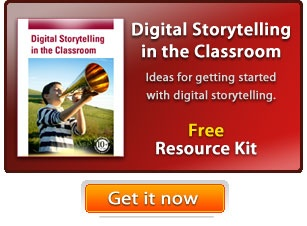 If students will be publishing the stories online through Wixie or as eBooks, have them record narration to each page. They can also use the Storyboard option on the bottom left corner of the Wixie interface to add transitions. Sharing student work with a public audience motivates students to research accurately and write creatively. Organize an event where students have an opportunity to show off their work. If students have published their work as books, booklets, or comics, print and display them in your classroom and school media center. You may also consider uploaded images of these pages to sites like Shutterfly to create and publish a book you can keep in your classroom or school media center. You can embed Wixie projects on a classroom web site and if your students have published their work as eBooks, create a page on your school web site to host the eBooks for download. This project works great as a performance task you can use to evaluate students understanding of how a snowflake is formed as well as their understanding of the climate conditions necessary for snowflake survival. During the process, you can easily evaluate student understanding from the cycle graphic organizer. Having students turn in their narrative writing and storyboards prior to creating the story will help you ensure that they are on the right track. The final product, whether it ends up as an eBook, animation, or video biography provides an opportunity for summative assessment. You may also want to include soft skills like teamwork, responsibility, organization, and problem solving as part of this final assessment. Kenneth Libbrecht. The Little Book of Snowflakes. NOAA How do snowflakes form? Make observations and/or measurements of an object's motion to provide evidence that a pattern can be used to predict future motion.